The Cadillac CTS is all new for 2014 and while there is no CTS-V so far, the new CTS VSport offers an incredible driving experience for those CTS buyers who demand more power than is offered with the non-VSport models – while including every bit of luxury that GM has to offer in this incredible sport sedan. 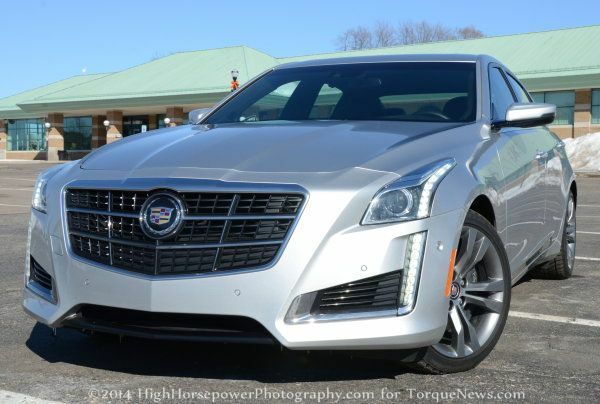 When the rumors about the 2014 Cadillac CTS were flying around prior to the new model’s debut last year, it was widely expected that the new CTS would be slightly larger in order to better compete with the BMW 5 Series. Like many other BMW models, the 5 Series serves as the benchmark for quality in its segment so to be the best – Cadillac aimed to beat the best. However, rather than opting for a big V8 like the BMW 550i, GM went with a new twin turbo V6 that offer comparable performance. A bigger car with a new twin turbo V6 had many people questioning whether this new CTS VSport can compete with the big boys from across Europe and after spending some time blasting around the Metro Detroit area in this new high performance CTS – the answer is a resounding yes. My 2014 Cadillac CTS VSport was equipped with the Premium package, which carries a price of $69,995 including the $995 destination charger. That is a hefty chunk of change for the new top of the line CTS sedan, but when you consider that the VSport Premium is SO loaded up that there are really no other options, it should give you an idea of what all you are getting for that price. This car literally has everything that Cadillac has to offer inside, outside and under the hood and when you compare the CTS VSport to pretty much any car sold in America in the midsized sedan segment – it is hard to find any features that competitors offer that isn’t standard on the CTS VSport Premium. The BMW 550i can be optioned with many of these luxury features, but you can expect to pay at least $10,000 more for a comparably equipped Bimmer. The 2014 Cadillac CTS VSport shares almost every physical aspect with the rest of the new CTS lineup so unlike the previous generation CTS-V, which had a vastly more aggressive body package to accompany the supercharged V8 engine, the new CTS VSport takes an approach that many people might call the “sleeper look”. There are no huge ducts up front, no massive bulging hood and no distinctive exhaust system – just a set of great looking 18 inch wheels and a subtle “V” badge on the right corner of the trunk lid. If you were to remove the V badge and swap to a different set of wheels, you really wouldn’t be able to tell this high performance model from any other new CTS. No twin turbo badging, no showy body kit and, really, the wheels aren’t all that extreme for a high performance models. If you loved the flash and flare of the previous CTS-V sedan, you might not love the fact that the V-Series doesn’t stand out more clearly from the rest of the lineup. With all of that being said, the 2014 CTS VSport certainly shouldn’t be discounted simply because it doesn’t have the same ultra aggressive exterior styling of the CTS-V as this new VSport as the basic lines of the entire CTS lineup make this one beautiful midsized sport sedan. Up front, the 2014 Cadillac CTS VSport benefits from the same handsome design as the rest of the 2014 CTS lineup, starting with a set of high tech headlights with LED trim and HID projection flanking a large angular grille. This look is similar in its basic design to both the ATS and XTS, with the vertical row of LEDs that begin in the headlights and flown down through the vertical driving lights to create a bold, high tech look. Some might find this design to be a touch unusual, but I love the look of the front end lighting on the new CTS as it feeds the whole “luxury sport sedan” angle perfectly. This is a Cadillac, so the front end features plenty of chrome in the headlights, around the driving lights and through the large grille with the huge Cadillac crest set in the upper portion of the front end. The sharp inward angles of the hood draw the eye to this large, distinctive grille while also providing an aggressive, angry look with the help of the wide, flat hood. There is no added chin spoiler or lower front fascia, but the design of the 2014 CTS goes a long way in making the VSport so handsome from the front. Along the side, the 2014 Cadillac CTS VSport is longer than the outgoing model in most dimensions but GM achieved this elongated feel in a way that preserves the sporty silhouette. The long, flat hood gives way to an even longer greenhouse that is punctuated by a slippery rear window that ends in a trunk lid that is so short, it is barely there. This shape doesn’t look quite as sporty as the outgoing CTS, but the upward running body lines and the high haunches give this big midsized sedan just enough attitude when viewed from the side. Again, you will find plenty of chrome down the sides while Brembo brake calipers tucked behind the painted split spoke aluminum rims are the only real indication from the side that this is a high performance model. Out back, the 2014 CTS VSport calls upon my sharp lines and flat planes to give this sedan a powerful sporty stance. The wheels poke out from under the rear quarter panels just enough to draw attention, but not enough to warn fellow speed freaks that this mild mannered Caddy is going to smoke them. Like the rest of the CTS lineup, the VSport features a set of chrome angular exhaust tips integrated into the lower rear fascia while the big, bright LED taillights draw most of the attention away from the subtle chrome V badge. As much as I like the standout exterior design of the previous CTS-V sedan, I love the simple design of the 2014 CTS VSport as this is a high performance sport luxury sedan that looks more luxury than sport – allowing the driver to enjoy the wow factor that goes along with driving a modern Cadillac while catching plenty of unsuspecting drivers of much slower sports cars off guard in the short light-to-light sprints that are so common around Metro Detroit. Not every executive wants a luxury sedan that appears to have been modified for high performance and it with those folks in mind that GM designed the look of the 2014 CTS VSport so perfectly. Like I said earlier in this review, my 2014 Cadillac CTS VSport Premium was fitted with pretty much everything that GM has to offer in terms of both luxury and technology. The larger wheelbase and larger body yields more passenger space – both for folks seated in the front and in the rear – along with an ample amount of trunk space that will easily fit golf bags, hockey bags or just a whole lot of groceries. The front seats are heated, cooled and feature an elaborate power adjustment system that allows the driver and front passenger to set the seats up to perfectly fit their frame. Whether you are 6’10” or 4’10”, the driver’s seat will adjust to make sure that you are very comfortable with plenty of lateral support during stints of hard cornering and the ultimate in luxury comforts during normal daily driving. The same can be said of the back seats, which have a sharper seatback angle to provide more comfort and afford rear riders more head room while the roomy foot well behind the front seats will allow even very tall passengers to enjoy the rear seats. The rear seats don’t offer the same supportive bolsters as the front buckets, but the outboard positions are heated and the middle seat is actually large enough to fit an adult- although three adults in the back seat won’t have a world of elbow or shoulder room so I wouldn’t recommend picking up four of your adult friends and driving 20 hours to Vegas. However, if you need to drive four coworkers to lunch now and then, they will all be comfortable – unless you get to using the lateral G forces to squish the rear riders onto one side of the car. The luxury sedan world has turned a great deal of attention to modern technologies and the 2014 Cadillac CTS VSport has it all – including the configurable gauge cluster and the huge touchscreen that controls the CUE infotainment system. While the CUE system has been criticized by some, I find that it is as easy to use as any other high end infotainment system on the market today after spending 10 minutes sitting in my driveway, playing with the various features. The touchscreen controls pretty much everything about the interior including the navigation program, the incredible Bose sound system, the hands free phone system, the climate control system and the vast majority of basic interior and vehicle settings. There are some touch sensitive “buttons” mounted in the gloss black panel just below the touchscreen (which pivots upwards to expose a hidden storage area) such as sound system volume, controls for the heating/air condition, controls for the heated/cooled seats and a power button to quickly shut the infotainment system down – but the CUE system does require you to rely heavily upon the virtual buttons on the large touch screen. As a cool aspect, the buttons on the touchscreen go away when they are not being used, but with the wave of a hand in front of the screen, all of the buttons appear to provide full control of all of the interior gadgetry. Next up is the 12.3” configurable gauge cluster, which is shared with the range topping Cadillac XTS. This system calls upon three large gauge areas with smaller information areas inside of each. With the push of a joystick style button on the steering wheel, the drive can flip from gauge to gauge, adjusting what is shown in each of the three panels including the vehicle information which you would expect from the gauge cluster along with a detailed navigation screen, a boost gauge (that I love) information on the sound system and pretty much anything else that you could want to know while driving. The many buttons on the steering wheel also allow the driver to change the radio station or adjust the stereo volume while also including a voice control button for the navigation program and another button for the heated steering wheel – which is a must for those who live in areas with real winter weather. The CTS VSport also features Cadillac’s heads up display that offers similar configurability to the gauge cluster, letting the driver select from features like a linear tachometer, navigation information, media information, the local speed limit and the vehicle speed. GM has been trying for a long time to get the heads up display right and with the 2014 CTS – they have knocked it out of the park. When combined with the huge configurable gauge cluster and the CUE infotainment system, the CTS VSport offers accessibility on the fly like few cars sold in America. Finally, while the 2014 Cadillac CTS VSport comes with a handful of different interior trim packages, the blacked out cabin of my test car is easily my favorite. From the headliner to the leather seats to the dash to the carpeting, this interior is black on black with just a touch of chrome here and there accented by carbon fiber inlay that bolsters the whole luxury sport feel. There is also a huge panoramic sunroof that is standard with the Premium package, offering some glass roof visibility to rear riders and open air fun for those up front. The new CTS VSport offers everything that you could want from a modern midsized luxury sport sedan with cutting edge technology, a stylishly striking look and comforts that are unrivaled by cars that have a starting price in the same ballpark as this top of the line CTS. The VSport package might focus on performance, but no shortcuts have been taking in making this new Caddy interior one of the most impressive on today’s market. The 2014 Cadillac CTS VSport is powered by the new twin turbocharged 3.6L V6, which sends 420 horsepower and 430lb-ft of torque to the rear wheels by means of a paddle shifted 8-speed automatic transmission. This 8-speed transmission allows the twin turbo V6 to get impressive fuel economy of better than 24 miles per gallon when cruising on the highway but far more importantly to me, this new gearbox affords the CTS VSport very, very solid acceleration capabilities. There is really no noticeable lag from the twin turbo V6 and as soon as you put the pedal to the floor, all 420 horsepower and 430lb-ft of torque sets you back in your seat without any hesitation…provided that you can get traction, of course. My time spent driving the new VSport came amidst one of the worst winters in Detroit’s history so I had the pleasure of experiencing this high performance luxury sedan in conditions that will bring many AWD SUVs to a stop. I was concerned that the CTS VSport would struggle with the deep snow covering slick ice, but the Bridgestone Blizzak tires fitted up to the VSport rims made this one of the best cars I’ve ever driven in the snow. To give you an idea of how solid the CTS VSport was in the snow, I had a four wheel drive pickup truck immediately after the new CTS and I had to use four wheel drive to get up my road with the truck while the 420 horsepower Cadillac easily climbed along that same road without any real effort – and without all wheel drive. I’m not exaggerating or being sarcastic – the CTS VSport was one of the best rear wheel drive sedans I have driven in the harsh winter weather so with just a set of good snow tires, I can attest that those folks living in snowy areas won’t need to lose any sleep about their twin turbo Caddy getting them from point A to point B. While it comes as a nice bonus that the 2014 Cadillac CTS VSport handles the snow so well, that only matters a couple months out of the year and only for select people around the US. What does matter is that this new CTS performance model offers incredible performance on clear roads that can only be rivaled by the rivaled by the best luxury cars in Europe. As soon as I pulled the new CTS VSport out onto a dry road and put the pedal to the floor, it was instantly clear that the concerns of the twin turbo V6 not being enough to make the new CTS a rocket were totally unfounded. Shy of the fact that this forced induction V6 doesn’t offer the same growl as the competitors’ V8 engines, there is really no shortcoming with this new drivetrain. Acceleration – whether from a stop or when already moving is effortless and instant so whether you are racing someone, trying to merge into fast moving highway traffic or trying to blast around fast moving traffic, the new CTS VSport is ready and willing. While the Blizzak snow tires hampered dry traction a bit more than I would expect from the normal performance tires, the CTS VSport still offered stunning acceleration from a dead stop, allowing me to hammer the throttle without all that much concern about traction loss. No matter what the driving situation when cruising, putting the accelerator to the floor causes the 8-speed transmission to pop down to a lower gear and away you go…screaming well above any posted speed limit before you can think about any mindless chatter of turbo lag. Also, with the inclusion of the paddle shifting system, the driver has impeccable control of both upshifts and downshifts for the highest level of control possible outside of a proper manual transmission. Whether you are popping through the gears while racing an unsuspecting Mustang owner from a stop or carefully selecting your gears during a spirited blast down a winding road, this paddle shift system affords the driver a level of control that is easy to love. General Motors boasted that the previous Cadillac CTS-V was the best handling luxury sport sedan on the market so it should come as no surprise that the 2014 CTS VSport has just as much effort put into the handling as it does the luxury and the raw acceleration. The VSport features the Magnetic Ride Control system that has helped the C6 Corvette, the C7 Corvette and the CTS-V so incredible, and that high tech handling system has the same impact on the new CTS VSport. In normal mode, the VSport does a great job of balancing ride quality and handling while switching to Track mode stiffens the suspension, makes the steering system more responsive (while also providing more feedback), adjusts the shift points and sharpens the throttle response for a far more engaging driving experience. While the Track mode makes the ride a bit stiffer when cruising on the highway, the difference isn’t enough for the average passenger to even notice the change from one mode to the next. However, the driver will notice a difference as the CTS VSport in Track mode handles as well as any luxury sedan I have driven. Whether you are rocking and rolling through the tight corners of a twisty country road or blasting along the long, sweeping turns at high speeds, the Track mode adds just that extra touch of handling confidence that you need to keep up with the best luxosport sedans in the world. On the off chance that you do get into a turn too hard for the suspension system, the CTS VSport calls upon a set of big Brembo front brakes to get the car down to a more manageable speed in a hurry. So the 2014 Cadillac CTS VSport launches, corners and brakes like a sports car but this is a luxury car and ride quality is very important. That is where the many splendors of the Magnetic Ride Control system come back into play. When cruising in the normal drive mode, almost none of the wind noise or road noise sneaks into the cockpit, creating a whisper quiet and smooth as glass ride that can be rivaled by very few cars sold in America. All of the high end luxury qualities that make the CTS such an impressive luxury sedan are still present in the CTS VSport – except the VSport also has the capacity to offer the sports car feel with the stomp of a pedal. To put it in the clearest terms that I can, the 2014 CTS VSport feels more like a big grand touring coupe than a sedan in every aspect of performance so those who want an incredible driving experience with the room of a roomy midsized sedan will be hard pressed to find a better option anywhere near the price of the fully loaded CTS VSport. This is a luxury sport sedan designed by people who love to drive for people who love to drive so whether you are driving the kids to school or blasting along a winding country road – the 2014 CTS VSport will keep the driver 100% entertained. While the $70k price tag might not be for everyone, every aspect of the 2014 Cadillac CTS V-Sport works together to justify the price of this new top of the line midsized Caddy. This car leaves nothing to be desired throughout the cabin and while it might not be as edgy as the “old” CTS-V sedan, this car is a beautiful display of the modern Cadillac brand design language from front to rear. Take that plush, loaded interior, add in the sleek, angular lines of the entire 2014 CTS lineup and finish the package off with a twin turbocharged V6 engine that delivers 420 horsepower and you have yourself what very well could be one of the best all-around American sport sedans ever to challenge the best from Europe. Some critics of the new Cadillac CTS VSport might complain that it “isn’t a true V Series” because it falls short of the 556hp output of the previous CTS-V, but none of that makes any difference when you are behind the wheel of this gorgeous new midsized Caddy. This car delivers breakneck acceleration, incredible handling characteristics, impressive fuel economy and every gadget that you could want from a modern luxury car. If you want a roomy midsized sport sedan that makes very good on the “sport” aspect that will provide every bit as much luxury as it does performance – or if you want to drive the pinnacle of American luxury performance - the 2014 CTS VSport is the car for you.